I cannot remember exactly when I met Mimi Mefo. What I remember is being impressed by this young, woman, Anglophone, journalist who constantly showed up at press conferences and asked questions relentlessly. Ms. Mefo really began to draw my attention during the Anglophone Crisis. She was one of the first to go beyond the declarations and press releases that the different actors were issuing. She began to go to the field. Cameroonians began to rely on Ms. Mefo for reports of the impact of ghost towns, of the internet shut down and of the impact of the Crisis on women and children. When we marched on Yaoundé as Mothers of the Nation, though she was not in Yaoundé, Ms. Mefo got footage from her colleagues and did one of the most in-depth stories on women from 5 regions in Cameroon, both Anglophone and Francophone who were asking for the violence and the killing to stop. She asked some of the women to come to Douala, interviewed them and featured them. Anglophone and Francophone women fighting side-by-side to stop the killing of their children. When we went to Batibo in the heat of the crisis, Ms. Mefo connected us with her colleague in Bamenda. She was the first to get the footage of internally displaced women and children and tell their story. She has reported about the military, about the armed groups, about the economy, about the social strife. As great journalists always do, she seized upon this crisis to improve her skills and heighten her profile as a reporter. In countries that function normally, Mimi Mefo would be on discussion panels and in government advisory groups. Someone somewhere would be considering her for a prize. Unfortunately, we are in Paul Biya’s Cameroon. He and his regime claim they won an election by 71%. It is therefore inexplicable why since that supposed win, the regime has unleashed a repression and intimidation campaign. It must be said that while most of the entire country was distracted by the election parody, Mimi Mefo continued to report on the Anglophone Crisis. Before, during and after the election, Anglophones were being killed, kidnapped and terrorized. Anglophone villages were being burnt. Ms. Mefo reported. Some of this atrocities were committed by armed groups. Many were being committed by the Cameroonian Army. Ms. Mefo reported. Why is Mimi Mefo being summoned to the Gendarmerie on charges of « fake news and cyber criminality »? Is it for her continued focus on the Anglophone Crisis? Is it because she dared to go to the conflict zones when few other journalists did? Is it because she refused to just repeat government rhetoric and carried out analysis? Reporting on a war in a country where government provides little or no information is challenging. Did Ms. Mefo make a mistake, wrongly report some incident or event? Perhaps. If she did, this is not a criminal offense. It is not one that merits the alarm of being summoned by the Gendarmerie, behind which lurks the terrifying idea of finding oneself carted off to the all powerful State Secretariat for Defense, known by its French acronym of SED (Secretariat d’Etat à la Défense). We’ve seen this happen all too often in Cameroon. 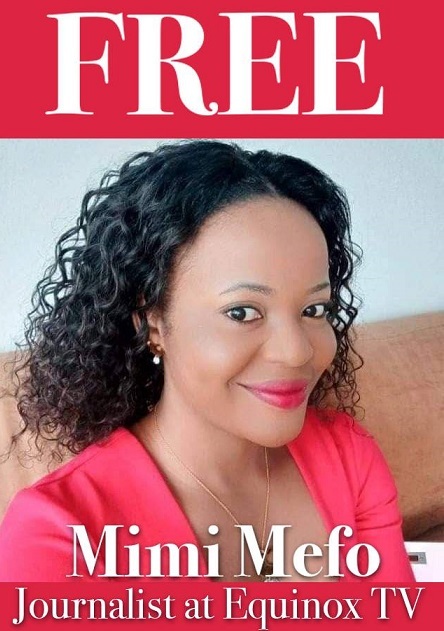 We stand up for Mimi Mefo because Journalism is not and can never be a crime. We stand up for Mimi Mefo because the number of people terrorized, arrested and killed in this Anglophone Crisis is already far too many. We stand up for Mimi Mefo because we need journalists who will go the extra mile and jump the extra fence to bring us information.